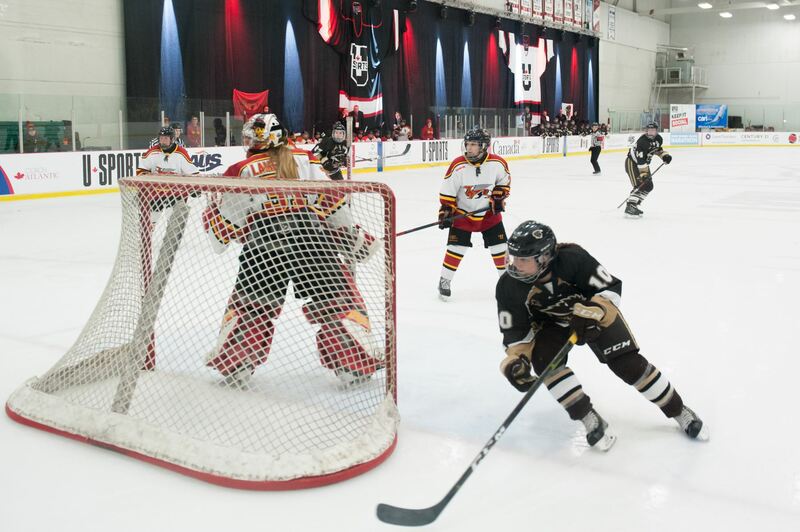 With a national championship ring already in hand, U of M Bisons women’s hockey forward Lauryn Keen is ready for her next test. Keen is graduating with an agribusiness degree this spring and said she already knows what comes next. “I’ve accepted a full-time job on a grain and cattle farm,” said Keen. The 22-year-old is from Manitou, Man., where hockey was the most popular sport to play. “I lived right across from the rink, so that was pretty much the only option,” she said. Growing up in a small town, Keen played hockey with boys from age three until she was in Grade 10. Playing the more rough-and-tumble style of hockey helped her grow into the player Bisons fans see today. “It helped me be a little more tough out there, a little more gritty,” said Keen. That toughness followed her all the way through to joining the herd in 2014. Keen weighed offers from other schools, but chose to stay close to home and all the comforts it brings, committing to the University of Manitoba. “U of M just seemed like the best fit,” said Keen. Keen is currently leading the Bisons in points, and is ranked third in Canada West scoring with four goals and nine assists. She took home the Canada West scoring title in 2016-17 with 34 points — nine goals and 25 assists — so Keen knows how to deal with success. “I’m just going out there, working hard every shift and my line has been clicking well throughout the year, so that helps a lot,” said Keen. Keen was a part of last season’s national championship team and said the championship season is something she will remember forever. “All season we’d been preparing for nationals,” Keen said. “Heading into nationals everyone was playing their best and everyone was clicking well,” she said. The 2016 series against Saskatchewan also stuck out in Keen’s mind. In game two of the series, the two teams played five gruelling overtime periods to find a winner. This year’s squad still has a large number of players that were a part of the national championship run last season. Keen said there is a different atmosphere in the locker room, but believes this year’s Bison team is just as special as the last. “I think we’ve been playing pretty well, and we’ve come back from being down and won a couple games there late in the third period,” said Keen.